← New Holiday Choices – It’s Not Too Late! We begin the year with a sobering event reminding us of the commitment many are making to destroy those with differing beliefs. It’s such an old story, isn’t it? One wonders how it still dominates the planet. For those of us committed to a consciousness of unity, the terrorist attack in Paris against a satirical magazine is a stark reminder of the importance of having a voice that bears witness to another way. It can seem that the way of love is a naive fantasy in the context of war and hell-bent destruction, but reflection on its power suggests otherwise. In Marianne Williamson’s first lecture of the year in Los Angeles, she posed that our consideration is not what will happen to us in 2015, it’s about who we will be. 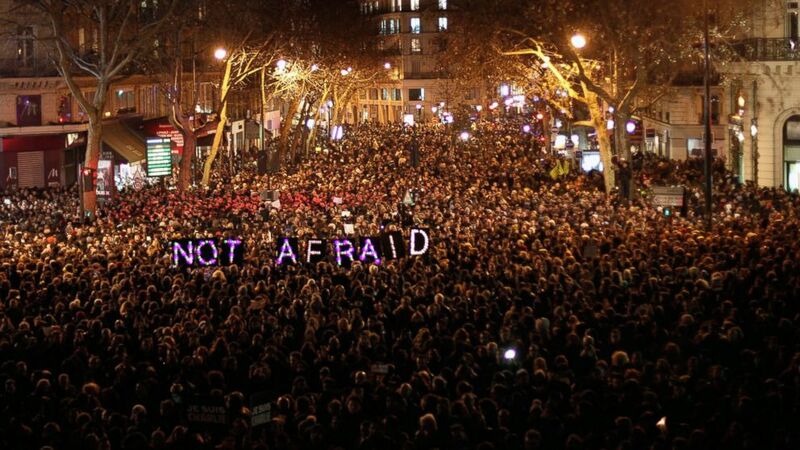 This is the statement of the Parisians who gathered following the attack. I’ve often envisioned the peoples of the world traveling to places where violation of the human spirit is rampant, gathering en masse to surround the area in a throng of silent recognition that this behavior is utterly unacceptable; holding absolution within their unified presence of love in a manner that commands the insane to relinquish their stance and return to the truth of who they are. Oprah Winfrey’s movie, Beloved, has a powerful scene that illustrates such an idea. When a poltergeist manifests as a young woman who commands the household in a distorted reality, a formidable group of black church ladies comes marching down the road toward the house. Joined in their resolution to cast the demon out, they are wailing, singing and praying loudly together as they walk. Their unified power is palpable, and when the afflicted woman appears on the porch, she falters in their presence as they demand that the spirit departs. And, indeed, it disappears. These women carried no guns. John Lennon knew. “All we need is love.” We all know. It is only unbearable pain that creates violence, and unconsciousness that perpetuates it. We have a global need to return to love and a personal responsibility to lead the way, however we can. Real change does not occur in the presence of judgment and fear. Change only becomes lasting when illumination reaches the heart and mind so absolutely that it simultaneously resonates with the soul’s knowing and becomes a newly created root of conviction, born of love. I may not know how to invoke the change I wish to see in the world, but the root of my conviction in our Oneness remains my guide for every step I take. It illuminates my path when I remain focused on its message. 2015 began with the compelling pull of a full moon, dragging us into our deepest feelings in order to purge the illusions and determine the truths we will stand for now. No matter how it appears, we have the freedom to write a new script. It’s in our power, and it’s time to realize it. Through our reflection in facing what arises, grieving, letting go and opening up – we can become clear and available for the universal calling to manifest a higher realm of life on Mother Earth. That’s what will put the Happy in New Year! This entry was posted in Coures in Miracles, Enlightenment, Healing, Inspiration, Spirituality, The New Year, Transformation and tagged Change, Consciousness, Course in Miracles, Enlightenment, Healing, Native American readings, Spiritual Counseling, Spirituality, Transformation. Bookmark the permalink.